If you're looking to escape the city and submit to serenity, then this is the excursion for you. Discover the beaches, bays, and villages on the gorgeous islands of Croatia's Central Dalmatia during a private full-day boat tour to the islands of Bisevo, Vis and Hvar. 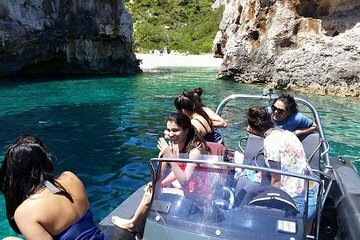 see the Blue Cave, Green Cave, Monk Seal Cave, Budihovac Island, the sandy beach at Smokova, and Hvar. Go wine tasting on Brac island to top off an enchanting day. Make your own way to Matejuska Harbour to meet your boat in the morning. Travel with your own private group of up to eight people, riding in comfort and safety in a fast (RIB) speedboat with a Suzuki 300 horsepower engine. You'll zip over to extraordinary locations in Central Dalmatia, stopping at islands that have hidden beaches and caves, along with impressive scenery and picturesque fishing villages. With some luck, you might even see dolphins or sea turtles. Departing from Split, you'll spend the day island hopping to Bisevo to see the Blue Cave, Vis to explore Stiniva Bay, and Ravnik, known for its Green Cave. Stop for swimming and snorkeling at the blue lagoon on Budihovac, visit the town Hvar, and go wine tasting on Brac. Return to Split after a fantastic day among the islands of Croatia.